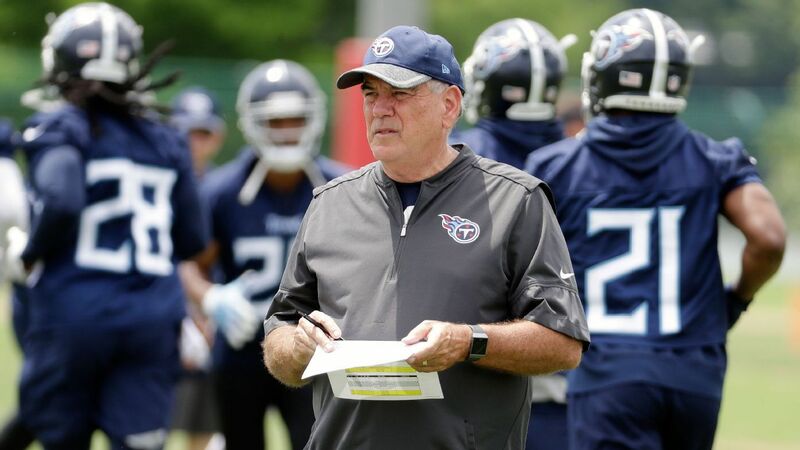 NASHVILLE, Tenn. — After experiencing health issues in 2018, Tennessee Titans defensive coordinator Dean Pees is returning for his 16th year as an NFL coach. Once he received a clean bill of health, coming back was an easy decision. Under Pees, the Titans finished third in the NFL in scoring defense, allowing 18.6 points per game. And opposing teams scored a touchdown on 44.6 percent of their red zone trips against Tennessee, the league’s second-best mark, trailing only the Eagles (44.3 percent). The players say they are prepared thanks to the tip sheets Pees provides. For example, safety Kevin Byard’s red zone interception against the Dallas Cowboys in Week 9 happened because of a tip from Pees. Byard said Pees alerted the defense to a specific part of Cowboys right tackle La’el Collins’ stance that indicated he was going to pass block. Dallas called a play-action pass, but Byard never bit on the run fake thanks to the tip from Pees, which allowed him to pick up the wide receiver running a crossing route and intercept the pass. Pees dialed up timely blitzes that resulted in sacks by sending Byard or cornerback Logan Ryan after the quarterback. Safety Kenny Vaccaro said Pees’ playcalling is like, “Jordan in the fourth quarter.” But the scheme will only get the Titans so far. The defense has holes to address, such as finding an impact pass-rusher. Outside linebacker Harold Landry, a second-round pick in 2018, is the Titans’ best option, but fourth-year linebacker Kamalei Correa is their veteran edge rusher. The Titans should add a veteran free agent such as Za’Darius Smith, who posted 8.5 sacks for the Ravens last season — including three against the Titans. Pees had an integral role in the Ravens selecting Smith in the fourth round of the 2015 draft. He was at Smith’s pro day in Kentucky and told him he’d be a Raven. And having Pees in place lessens the risk of the scheme not matching the player, because Smith has already excelled in the same system. Smith would give the Titans a player who can line up at outside linebacker in base defense and as a four or five technique in nickel packages. Defensive tackle Jurrell Casey draws a lot of attention from opposing offenses and needs a running mate who can take advantage of one-on-one matchups. Adding a pure outside linebacker in the draft — such as Florida’s Jachai Polite, Mississippi State’s Montez Sweat or Florida State’s Brian Burns — would be the finishing piece for the Titans’ defense. A rookie could provide pressure off the edge, giving quarterbacks less time to wait for the wide receivers to run their routes, thus helping the secondary. Tightening things up on the back end is crucial for the Titans’ defense to take the next step. The secondary struggled early in the season, giving up big plays such as Eagles wideout Jordan Matthews’ 51-yard touchdown reception and a 75-yard score by Chargers receiver Tyrell Williams, but they rebounded and finished with seven plays of 40 yards or more allowed. “Whenever you have a secondary that doesn’t give up big plays, you are going to have a heckuva defense,” Pees said.